MEZZA offers authentic mediterranean and american cuisine with a modern touch. All of our dishes are prepared with the freshest ingredients so that we may offer the most delicious food possible. We have recently moved to our beautiful (and larger) new space - offering wonderful ambiance, new enticing dishes and an intimate private dining room. We look forward to seeing you all here! We have been here so many time and every-time its excellent. The staff tries very hard to be helpful. However, it often comes across as rushing the customer and this detracts from the food and experience. 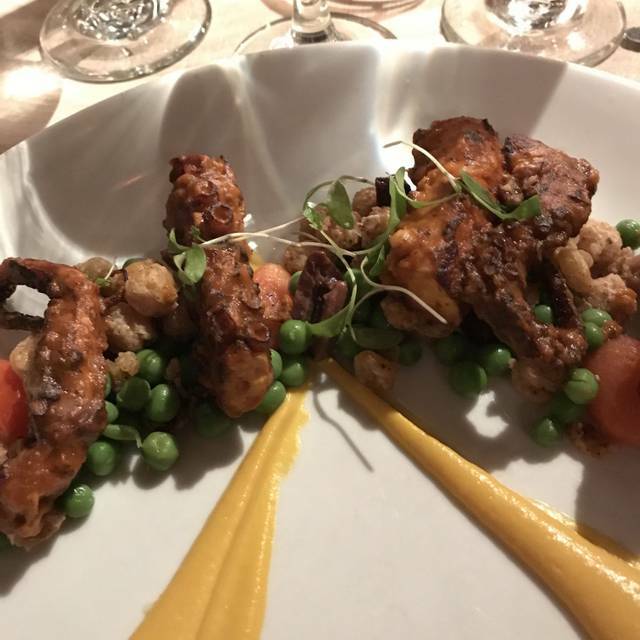 The food at Mezza is always outstanding! Although full, they promptly honored reservation for 2nd seating at 8:00. Staff was cheery, helpful and knowledgeable. Both our dishes were delicious and prepared with whatever changes we made to the menu items. The hummus was outstanding, Mediterranean salad very good and both the bronzino and seafood couscous were delicious. I will definitely go again. Amazingly tasty food and great service. I really have not tasted food like this anywhere. Expensive but worth it. I will be coming back. Love Mezza! Food is always good and service is wonderful! Excellent food & service. Very expensive. Always excellent, we do appetizers and dessert, more than enough food. Best hummus I’ve ever had!! Nice ambiance, very good food, most delicious hummus ever, excellent and attentive service. Will go back soon. We all enjoyed it very much! The halvah dessert was scrumptious! This is a wonderful restaurant. The food is sublime. We have yet to have a disappointing meal here. The service is excellent. The wait staff is very attentive but not intrusive to your dinner. The staff was wonderful in helping my handicapped husband . The hostess came out to meet us /at the car and did the same at our departure . The owner (?) helped him get seated. We were seated near the drafty door when there were plenty of other tables available, we were there at 6:30. The server was very nice and helpful. When it came time to pay we were very rushed. They clearly did t want us sitting there and they made it known. I would not go back any time soon. I also would not order the salmon again. My favorite in all of NJ...all around excellence in every category. My go-to for my birthday celebration every year, not to mention countless date nights, girls nights...love. Mezza! Dinner date with the hubby.. ...had Octopus appetizer and Crab Cake appetizer. Our dinner was the sautéed Branzino and Lamb Shank with Spinach and Orzo. Dessert Carmelized Rice Pudding and Lemon Tart. The service and food is alway top notch!! Always an enjoyable evening out when at Mezza!! back very soon. This is a must restaurant. Excellent food and top notch service. Superb! We were seated at a table in a small private room with two tables behind a heavy drape. It was secluded and less noisy than the main dining room. Ryan was our server who attended to us with expertise & promptness. We ordered a serving of lentil soup, babaganoush, & cigar rolls. Last time I was at Mezza I thought I remembered some hummus at the table with the pita bread. None this time. Our cigar roll appetizers were served late after the other two people at our table had already finished their apps. Main entrees were duck, hangar steak kebobs, grouper, lamb lollipops. My grouper was delicious over risotto although quite a stingy serving. Duck was unimpressive and wouldn’t be ordered again. Lollipop lamb chops were delicious and prepared well. Hanger steak kebobs not a big hit. 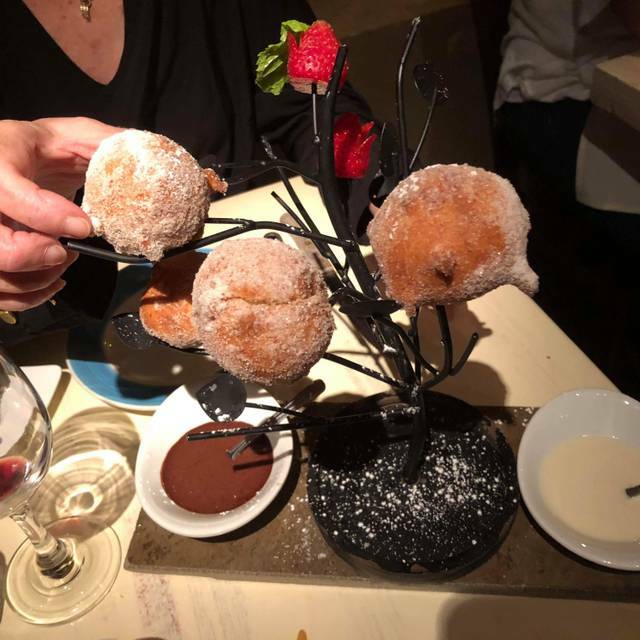 I do have to recommend the yummy fried ricotta balls served on a metal “tree” with lemon sauce & chocolate sauce. Unique presentation. What a find. Absolutely great food!! From walking through the door until we left it never disappointed. I can’t wait to go back!! We had a great time at dinner at Mezza. The food and service were great. 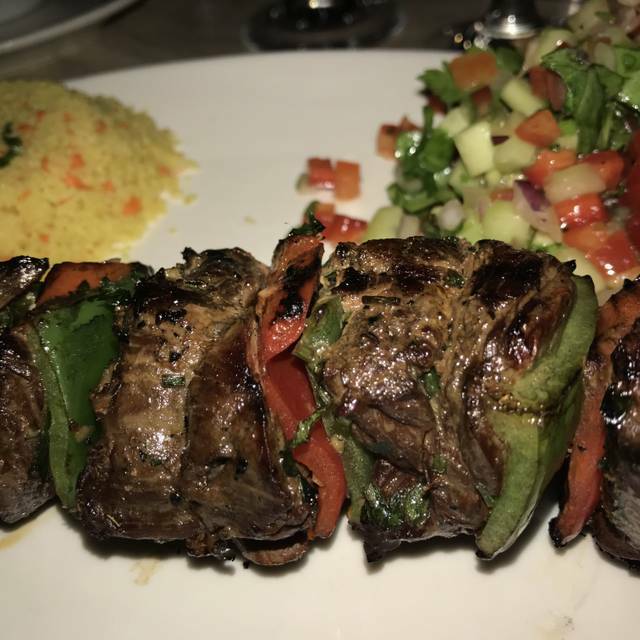 We enjoyed the skirt steak and the steak shish kabob. The cappuccino cheesecake which was phenomenal! We loved our pre Valentine visit to Mezza! The service was polite and just the right amount of attentive, including a chat with the owner. 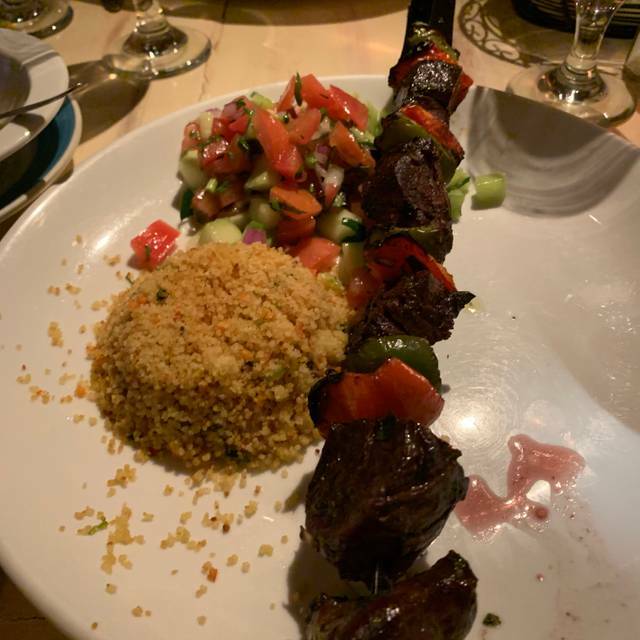 Food was delicious, from the hummus and pita to the grilled branzino and hearty lamb shank, to the bright flavored cantaloupe sorbet and herbal tea, we were impressed. Not so rich that we were overly stuffed, and with fresh Mediterranean flavors in our memories, we left wanting to return soon! We had a great evening with some good friends. The apps were fantastic, especially the octopus and halloumi. The entrees were great too, the sea bass special was a standout. Our server Elizabeth suggested the Lemon Tart for dessert, and it was one of my all time favorites. Fantastic crust and perfect tartness. This was a nice evening and can't wait to go back. Food is always terrific, no complaints there. My only real issue is their 2 hour dining windows on the weekends. I understand the limit, however we had a 6:30 reservation, and I wanted to order the chocolate souffle which said took 30 minutes to bake. I tried to order it at 7:45 and was told it was "too late". Really? Very obnoxious in my opinion, since I had 45 minutes left on my reservation. Plus, they make no bones about basically kicking you out, as they put the check on our table at 8:30. Excellent and consistent on all counts. Always excellent food and service constant in food quality. Amazing! Everyone from the hostess to our waiter Marty was so kind & friendly & attentive. It felt like we had eaten there for years! The food was delicious I ordered the chicken tajine & it was so juicy & full of flavor! If you are looking for drinks it is a BYOB but the hostess did let us know about a store nearby in case we were thirsty. Would absolutely go back again! The food was very good. The service was outstanding. The staff was extraorinary and went the extra mile to make us feel great and enjoy ourselves. We couldn't decide between 2 dips, so they gave us one and another small plate of the other one just to taste. They didn't have gluten free bread so they gave us sliced vegetables to use for the dip ( they did have gluten dree dishes). We had a great experience and we will definitely come back. Coming back this weekend it was so good. Enough said. Nice restaurant for a date night. Food was very good. Our night at Mezza was perfect. Service was excellent. Food is superior. Appetizers are interesting. We had the Moroccan cigars. The fish and chicken were done perfectly. Both were very moist . Dessert was a chocolate souffle. You can bring your own wine which is a plus. Parking is easy. Can't wait to go back! Always a good experience. The hummus, short ribs and the chocolate soufflé are highlights on the menu. Mezza demonstrates that excellent and creative food does not have to come in a pretentious package. This place shows that a caring staff and a chef that is creative and original can make a dining experience special. We took some friends and all agreed it was one of our best dining experiences. Great food but we had the 6:00pm reservations and they rushed us through.